Mali Lynthraceae Vede Mecum is the name of the 333rd level (the "middle") of the Abyss. Created by Demos-Gorgos wanting to put as much distance between himself and Set, the Gate of Chaos fractured into a million shards... each becoming a level of the Abyss. Though the outer rim reformed around Demos-Gorgos as the "666th", the Abyss is infinite and full of universes. Some are evil, some are random, and others just are. The further from Demos-Gorgos, the more "benign" the Abyss is, unless that part is claimed by some other denizen. For all we know, our Earth could be on the 1st plane of the Abyss. Some sages seem to think so. The great sage Alaura speculated in her Dissertum Opinionae that Tehra is actually a world in the Abyss rather than a unique universe all together its own. Regardless of where Tehra is, Mali Lynthraceae Vede Mecum ("evil pomegranate tree" in Latin) lies somewhere in the center. Rather than journey out, it is an intelligence that sends out avatars (pages of itself) into the multiverse. Each page is part of it. Each page wants to capture the soul experience of whatever sentient creature it encounters. Each page is indestructible and has a sentience of its own for the purpose of acquiring soul knowledge. When Morbatten first encountered it, Alerius tried to teach Dar Tania and the others how to say it in the eldar language. They could not. So, he shortened it to Tenebris Animus, which was later corrupted by Taysoran Common to "Darkhold." The Darkhold is able to observe and determine who is using it. It can call on all its captured souls to determine the language, and likely interests of a reader. It's first question or interaction is most often, "For what, would you know?" but it can also provide a prompt, a snippet of information. If the reader is interesting enough to capture, the Darkhold will engage in a question and answer session until it can psychically determine what will most allow the creature to be manipulated. Using the Darkhold comes with a price - the reader's soul. While the truth is always presented by the Darkhold, there is no content, no filtering, and no regard for the naked truth. Through this, the Darkhold twists the reader's mind to always want more and more information. At a certain point, the Darkhold consumes enough that it can attempt to eat the reader's soul. Other readers willingly enter the Darkhold for access to the knowledge therein. Whatever, whoever, when/wherever a soul enters the Darkhold, it knows the totality of what that person knows. In this way, the Darkhold does not require worshippers, to travel, or anything else. It sits in the Abyss content to consume, acquire knowledge, and sample the multiverse. There is a story of a dragon priestess who used the Darkhold to acquire power. She was able to break her obsession with Darkhold before being consumed, but it never lost its taste for her. Years later, a small child asked the priestess for her autograph. She signed her name on a page of the Darkhold and was consumed. The Darkhold is patient, devious, and ultimately it gets what it wants. The Darkhold exists in many forms.... single pages, pamphlets, copied books, and the original. Tania acquired access to the original by feeding it a grey slaad. Through testing over centuries, they learned that very few are able to use the Darkhold and resist its allure. The throneplane of the Darkhold looks like a twilight lightning storm of raining papers swirling through arcs of lightning. Any single page contains a captured soul. Pages may be interacted with for the Darkhold itself or for the soul contained therein. If the Darkhold knows enough about its reader, it will mask a captured soul to look like someone the reader loves... to entice more interaction. 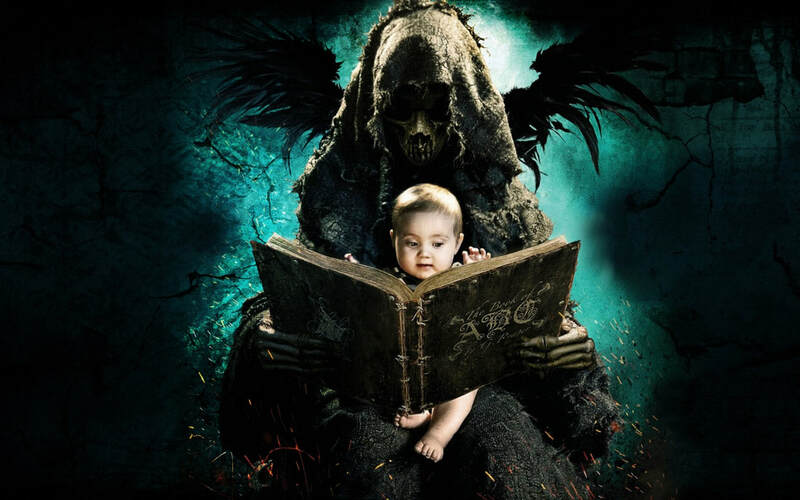 The Darkhold has no physical form except the pages and the book form. As such, it has no avatars and no sentient form. However, it is very powerful. Takhissis encountered the Darkhold before the Dragon Wars and wrote her name on it. Through this, She learned about Time.... and vowed to never touch it again. If the adage is true... that knowledge is power, and power corrupts... then the Darkhold is the manifestation of this adage being both powerful and corrupted. The tortured souls bound therein retain a terrible existence caught by whatever obsession the Darkhold first latched onto them with. After all, what better way to know a sentient being than through the enactment of their most terrible fears, regrets, and psychosis?